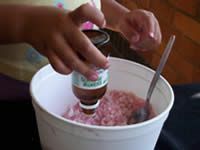 Let your children make their own coloured bath salts to bath in. This makes the water nice and soft and helps them relax and calm down at night before bed time. That way they get fun, coloured water to bath in, and they get the calming effect of the lavender aromatherapy oil. Put one cup of coarse salt into each bowl. Add half a teaspoon of red food colouring to one bowl of salt, and half a teaspoon of blue food colouring to the second bowl of salt. 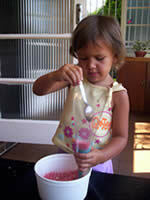 Mix all the food colouring well into the salt in each bowl. 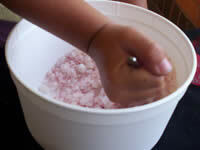 Slowly add 8 drops of lavender oil to the pink bowl of salt and 8 drops of oil to the blue bowl of salt. 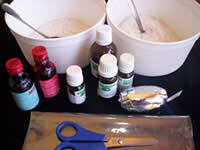 Now mix the aromatherapy oil into the salt. 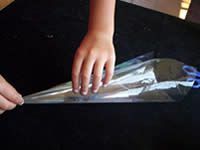 Form a cone shape with your cellophane and seal with sellotape You can also close any holes in the point of your cone with sellotape. 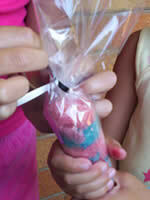 Fill up the cone with one teaspoon of salt at a time. 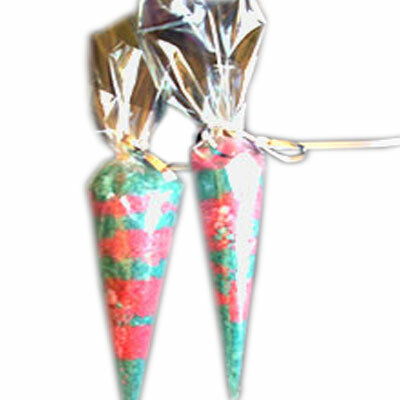 Alternate the colours so that they make different layers in the cone. Tie a piece of ribbon around the top of the bath salts once full. Now you have some fun colour to play with in the bath. Your bath salts are now complete and ready to be used!